The 6.7 billion human inhabitants of the earth have the ability to drastically alter ecosystems and the populations of species that have taken eons to evolve. By better understanding how our actions affect the environment, we stand a better chance of designing successful strategies to manage ecosystems sustainably. Toward this end, the Third Interagency Conference on Research in the Watersheds (ICRW) was convened in Estes Park, CO, on September 8-11, 2008. The Conference provided a forum to present adaptive management as a practical tool for learning how to manage complex ecosystems more sustainably. Further complexity introduced by spatially variable and continuously changing environmental drivers favors this management approach because of its emphasis on adaptation in response to changing conditions or ineffective actions. For climate change in particular, an adaptive approach can more effectively accommodate the uncertainty in future climate scenarios. Scenarios compiled by the Intergovernmental Panel on Climate Change are built on distinct economic, energy, and societal models. The scenarios predict potential changes in greenhouse gases, temperature, precipitation, and atmospheric aerosols, which would have direct or indirect impacts on the timing, volume, and quality of runoff, vegetation, snowpack, stream temperature, groundwater, thawing permafrost, and icecaps. Through presentations and field trips, researchers and stakeholders described how their findings and issues fit into the adaptive management 'learning by doing' paradigm of Assess > Design > Implement > Monitor > Evaluate > Adjust > Assess. The larger PDF for SIR 2009-5049 combines all papers, support material, and front matter contained in the ICRW Proceedings. To immediately access smaller PDFs of the individual papers included in the ICRW Proceedings, use the links listed at the bottom of this webpage or the links within the Contents section of the “Front Matter” PDF. 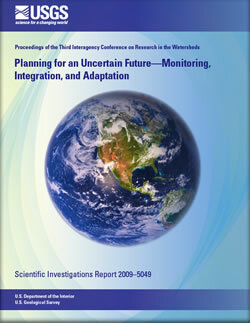 Webb, R.M.T., and Semmens, D.J., eds., 2009, Planning for an uncertain future—Monitoring, integration, and adaptation. Proceedings of the Third Interagency Conference on Research in the Watersheds: U.S. Geological Survey Scientific Investigations Report 2009-5049, 292 p.
H.L. Buss, D.W. Clow, R.J. Hunt, M.A. Mast, S.F. Murphy, N.E. Peters, S.D. Climate Change Adaptation Lessons from the Land of Dry Heat, by G. Garfin, K.
Paleoflood Research of South Boulder Creek Basin near Boulder, Colorado, by R.D. Sediment Quality in Central Colorado, by S.E. Church, D.L. Fey, T.L. Klein, T.S. with Natural Acid-Rock Drainage, by A.H. Manning, J.S. Caine, P.L. Verplanck, D.J. Implications for Contaminant Fluxes—Initial Results, by H.E. Golden, C.D. in a Semiarid Watershed, by M.S. Moran, E.P. Hamerlynck, R.L. Scott, W.E. Impacts to Lakes in the Trout Lake Watershed, Northern Wisconsin, by J.F. Use of Online Decision Support Tools, by C. Mullinix, S. Phillips, K. Shenk, P.
Climate-Induced Changes in High Elevation Nitrogen Dynamics, by J.S. Baron, T.M. Watershed Approach, by T.L. Deboodt, M.P. Fisher, J.C. Buckhouse, and J.
Herbicide Transport Trends in Goodwater Creek Experimental Watershed, by R.N. Agricultural Use—Implications to Hydrologic Assessments and Modeling, by C.C.